Despite the winter-weather conditions Tuesday night, over three dozen residents trekked through the snow to get to Canal Street for the Causeway Street Redesign presentation. As part of the Connect Historic Boston Initiative, pedestrians were the first priority of the project while a large emphasis was put on cyclists to attract more cycling throughout the city. 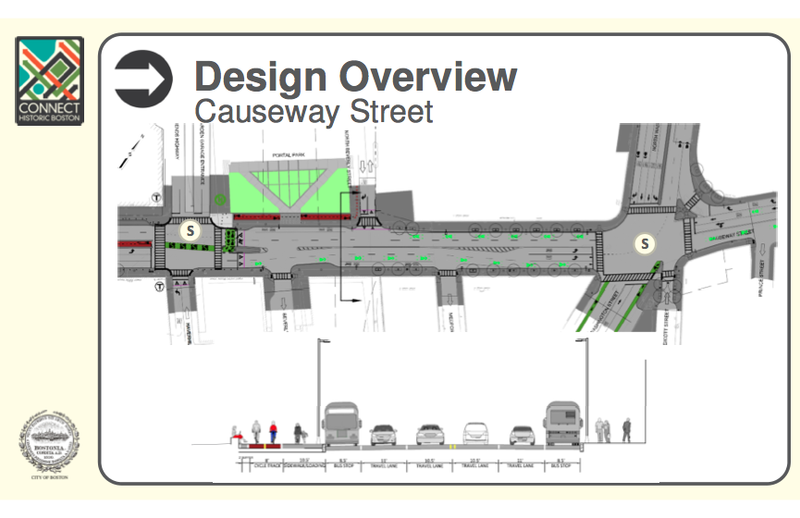 Causeway Streets cycle tracks will have no “ups and downs” anymore, they will be at the same elevation as the road, alleviating the plan to elevate the cycle tracks and lower them in intersections. Modern lighting and trees along the street are additional improvements that will be made. There will be 10-foot wide cycle track in middle of the road, with a raised curb on each side of the cycle tracks – separating the cycle track from the road. 6 foot pedestrian refuge on each side of the cycle tracks where there are intersections that will separate the cycle tracks from the roads and offer pedestrians a refuge. Throughout the street, three signals will be at bike lane intersections – prior to the cross walks. Cycle tracks will be painted red, conflicted areas of the cycle tracks are painted green. 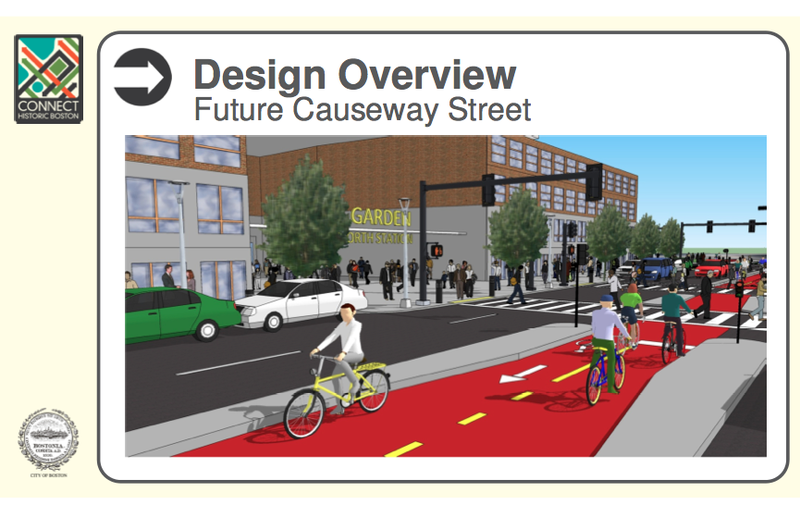 Below is Causeway Street in front of the TD Garden, cycle tracks will keep bikers away from pedestrians walking on the sidewalks and will separate cyclists from cars on the road. Providing a safe and efficient lane for cyclists. Below is a view looking down Causeway Street. Check out how the road is structured with the bike lanes, pedestrian refuges (curbed islands separating the cycling tracks and road) and the color change in the cycling tracks through intersections. 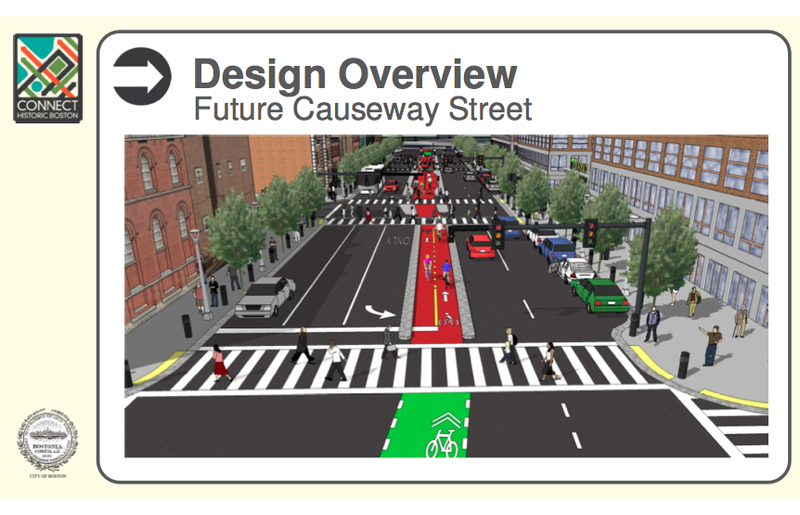 Below is a view of how the bike lanes will look and interact with each other, pedestrians, and cars on Causeway Street. Notice the designated signal lights for cyclists before the cross walk. When the floor was opened for questions, there was a wide range of questions and concerns raised by cyclists and residents. – Will the handicapped parking be kept in front of West End Place? 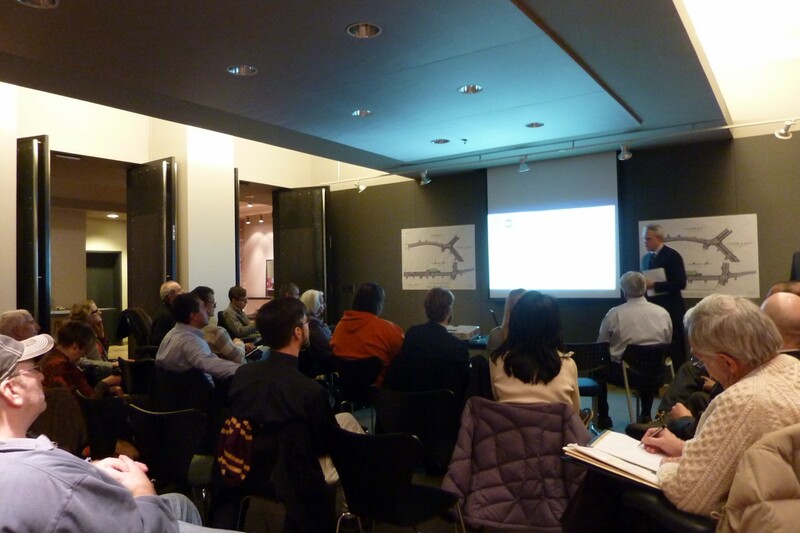 – Concerns about added traffic and residents in the Lovejoy Wharf. 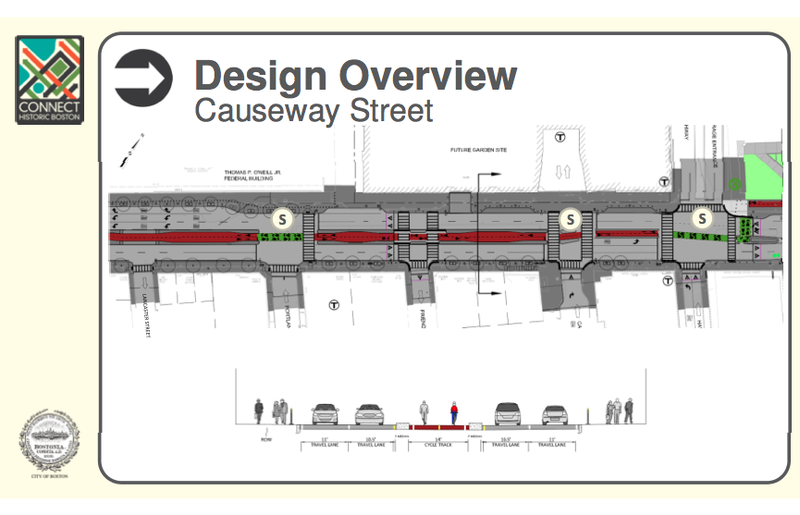 – The need for contingency plans on Causeway Street for jaywalking. The next Meeting is set to take place in late January. See ConnectHistoric-Boston.org for more information. Questions or comments can be sent to Vineet Gupta, Boston Transportation Department at (617) 635-2756 or vineet.gupta@cityofboston.gov. Bike the Cycle Track with Boston Bikes! Cyclists in the middle of Causeway St…what could possibly go wrong?